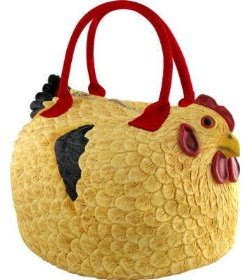 This purse is a rubber chicken. Someone on Amazon said it makes a great manbag. Can anyone tell me why the girl with the chicken bag crossed the road? Hm...oh. dear. Novelty christmas present maybe?! Haha! It remainds me a present that Mr.Big does for Carrie..it was like this,but too much shiny! I'm guessing she threw herself into traffic to spare herself being seen carrying that bag.